How to be an Advocate – Make Yourself Heard! 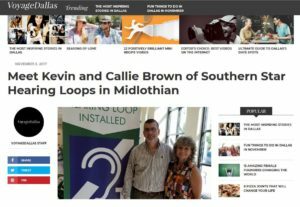 Midlothian Mirror has published a front page story about us building our Hearing Loop business, Southern Star Technology. Check it out. We’re featured in Voyage Dallas Magazine! Voyage Dallas has published a feature story about our journey in building our Hearing Loop business, Southern Star Technology. Check it out. 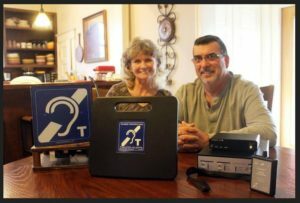 Southern Star Technology would like to design and install a hearing loop at your venue. Fill out our convenient online form to set your FREE, no obligation quote on a hearing loop system. You don't have to be a member of the HLAA to join us at the next Expo in 2020, but if you join, you will be a part of an organization that provides information, education, support and advocacy to those with hearing loss. Plus you'll make new friends that quickly become family! Even with the torrential rain storm on Saturday we had a good attendance at the Expo. We were welcomed by Dr. Shirley Molenich, Sertoma Club of Fort Worth and Carey Terry, HLAA Fort Worth President. We had great speakers who were very informative. We learned about looping from Kevin Brown, Southern Star Technology, all about hearing aids from Marylyn Koble, MS, CCC-A. Genetics and Hearing Loss was discussed by Becky Althaus from Cook Children’s Medical Center Genetics Clinic. Assistive Technology for Persons with hearing loss by Gema De La O, Deaf and Hard of Hearing Specialist, Deaf Action Center followed by Lisa Christensen, Au.D., Cook’s Medical Center, telling us about testing the hearing of babies. Dr. Marc Dean, MD, ENT, spoke via Skype about progress being made in Hearing Regeneration/Hair Cell Regeneration. The expo ended with a panel of HLAA members relating their hearing loss journeys. Just finished laying down a temporary loop for the Hearing Wellness Expo at the Tarrant County Medical Society in Fort Worth, and hosted by the HLAA/Fort Worth Chapter. Proud to do this for the 2nd year in a row. Look for our booth there tomorrow morning. Looks like you’ve got a great helper! Teach ‘m young. Awesome and I'm working tomorrow so not able to make it. Hearing Loops installed at MORGAN'S WONDERLAND in San Antonio, Texas! We just returned from Morgan's Wonderland, which opened in April 2010 as the world’s first theme park designed with special-needs individuals in mind. We installed five Counter Loops (pictures below) for the hearing impaired in conjunction with our manufacturer Contacta, Inc. The completely wheelchair-accessible park features both an amusement park and water park. Anyone with a special need is admitted free of charge. JMJ. Wish more Churches had this. New Hearing Loop system was recently installed in the Grand Forks, ND County Courthouse. Three zones were created in the courtroom; where attorneys and public are seated, where the jury sits and where the judge and witness sit. The presiding Judge, Don Hager says "So, for me, it's a Godsend every day to be able to sit in that loop system. It's a stark difference." Tell him Minnesota‘s highest court is already looped! Such an enthusiastic doctor with a great message about telecoils! The Benefits of a Hearing Aid Telecoil for Wireless Connectivity in a Public Venue. Dr. Cliff Olson, Audiologist and founder of Applied Hearing Solutions in Anthem Arizona, discusses Telecoils and why they are so important for hearing better in a public venue. Recently, Bluetooth has taken all of the wireless attention when it comes to hearing aids. However, telecoils are considered the original form of wireless hearing aid communication and could be the single best feature for hearing better in a public venue such as a church, movie theater, performance theater, or convention center. All you have to do is look for a blue sign with a picture of an ear with a line through it, with a little "T" in the corner. This means that all you have to do is activate your Telecoil and you will be able to hear better in that environment. A telecoil also allows you to hear better on a telecoil enabled phone. If you have trouble on the telephone, a telecoil could be your best friend. Just look for a phone with a "T" rating. These ratings range from 1 to 4 and number 4 is the best. A telecoil, also know as a T-Coil is an extremely small coil of wire that can be installed inside of a hearing aid. This T-Coil can pick up Electro-Magnetic signals from an Induction Loop that is installed inside of one of these facilities. Imagine that you go to a town hall meeting in your home town. If that facility has an Induction Loop connected to their sound system, the T-coil could pick up the sound of whoever is speaking into the microphone at the meeting and send it directly into your ears making their speech significantly clearer than with just using your hearing aid microphones alone. While telecoils are small, they do take up valuable real estate inside of a hearing aid. This is why many manufacturers have elected to remove the telecoil from their devices or have made their devices larger. However, Phonak, has been able to keep the size of their devices small. Their new Audeo Marvel 13T and Audeo Marvel 312T hearing aids are super small and still have a telecoil inside of them. But Phonak didn't stop there. They were also able to keep Bluetooth Classic and Binaural VoiceStream Technology (BVST). With Phonak's Bluetooth hearing aids, you can connect directly to any smartphone including Android and iPhone. This means you can play audio directly from your smart device right into your hearing aids. This includes Phone calls, Podcasts, Music, YouTube videos, or any other audio that plays from your Smart Device. Somehow, Phonak has also been able to keep Binaural VoiceStream Technology (BVST) inside of their devices. This allows each hearing aid to communicate with the other to help you hear better in a background noise situation. The fact that Phonak made a hearing aid without sacrificing other wireless features is truly impressive. The system, many say, is especially important in an arts-centric town with an aging population. Could there be an audio hearing loop in movie theaters? Never seen it setup as of yet. Not every sign of hearing loss is as straightforward as having trouble hearing. Discover these three unexpected signs for early detection.